Condition is as new. Only worn a couple of times. One button. Ladies Coat Size 12 Debenhams Collection light blue colour Lightweight jacket Worn only a few times so perfect condition. Feel free to ask me any questions. With detachable hood and pockets. Condition: Used. Good Clean. Smart vibrant red jacket from Debenhams in a size 16. Three quarter length sleeves and fully lined this jacket has three buttons and mock pockets. Laid flat this jacket measures 20 inches across the bust from armpit to armpit and 23 inches from back of neck to hem. Fabric is 62% polyester, 32% viscose and 6% elastane. Lining is 100% polyester. Suitable for machine washing or professional dry clean. Perfect to dress up or down and easy to wear this is a gorgeous item. Worn a couple of times but in excellent used condition. We are a pet and smoke free household. Debenhams Ladies Trench Coat Size 12 Knee-length. Fully lined Fab Condition. Thank you for looking! Please check out my other items I have for sale. Collection Debenhams White Blazer Size 10. Condition is New with tags. Dispatched with Royal Mail 2nd Class. Ladies Denim Jacket Size 12 - Dark Indigo Fantastic gently worn condition. This coat has barely been worn and so is in excellent condition with no visible wear. Size UK 16 Collarless Jacket From Debenhams' Classics Collection. Colour Cream / Ivory. Necklace and top not included. 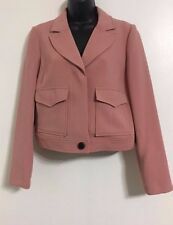 Debenhams women jacket size 12 used. Condition is Used good condition Dispatched with eBay delivery – Shutl 1 day. Ladies Green Mac Debenhams. Condition is Used. Size 12 petite, used (has a small grease mark on the belt) but perfectly OK to wear, I tie the belt so don't see any marks. Gorgeous Navy Coat By debenhams Size 10 . Condition is Used. Lovely smart coat. Ladies Beige Lightweight hooded Jacket 16. With zip and popper fastening. Sleeves can be full length or turned back with popper fastening. Adjustable gathering at bottom of jacket. 23” across chest from side to side Didn’t have much wear as lost weight just after purchase. I post to uk only . 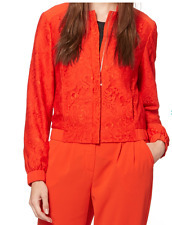 Ladies 'Blood Orange colour' lightweight casual jacket size 16. Condition is Used. Dispatched with Royal Mail 2nd Class. ladies size 16 debenhams raincoat. black with cream piping in excellent condition as hardly worn. Grey double breasted trench style coat. 2 pockets at the front and a tie belt. Fully lined. Great condition from a smoke and pet free home. Ladies Reefer/Peacoat Style Double Breasted Jacket, Beige, Size 12 Petite. Condition is New with tags. Has just been hanging in my wardrobe, never worn. From pet and smoke free home. Ivory blazer jacket. Great winter blazer. Dress it up or down. Collection Debenhams Ladies Jacket Uk 12 Cream Smart Spring/summer. Dispatched with Royal Mail 2nd Class. A gorgeous jacket in lovely condition...never worn. It is a very pale cream ....almost off white Soft weave polyester. 2 pockets at the front. Pit to pit 19" Length from back of neck 24" You will love it! Lovely ladies fawn coloured coat.size 12 brand new. The Collection from Debenhams smart jacket size 14 in unusual black and neutral pattern and great detail on the back. 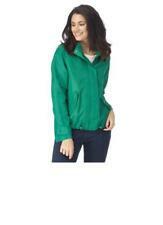 This is a lightweight three quarter length showerproof jacket which has had very little wear. Centre back to hem 35 inches. Pit to pit 21 inches. Sadly now too small for me. I only sell my own unwanted items. From a smoke and pet free home. Debenhams Size 16 Caramel Coat. Condition is New with tags. Dispatched with Royal Mail 2nd Class. Planet Jacket Size 10. Condition is Used. Dispatched with Royal Mail 2nd Class. Henry Holland (Debenhams) Denim Jacket With Aztec Print Trim - Size 12. Vgc. 100% OF PROCEEDS DONATED TO RSPCA Every penny from the sales goes directly to the Longview Animal Centre, therefore to the animals! Very good condition. Length 25.5" (from back of neck to hem). Debenhams Maine woman’s coat size 12. Condition is Used. Dispatched with Royal Mail 2nd Class.